BEAUTIFUL, FRESH, CLEAN & MOVE-IN READY SINGLE FAMILY, 1 STORY HOME, WITH PREFERRED 2003 CONSTRUCTION, ON A LARGE CORNER LOT WITH *ANY EQUITY MEMBERSHIP LEVEL*! OPEN & BRIGHT W/ HIGH 10-12 FT. CEILINGS, TRAY CEILING/ TILE INLAY FLOORING IN FOYER, GAS COOKING, BRAND NEW AC, CARPETS & PAINT. PLANTATION SHUTTERS LEAD TO A (FLORIDA WILDLIFE FREE) SCREENED-IN PATIO WITH PRIVATE GARDEN VIEW. 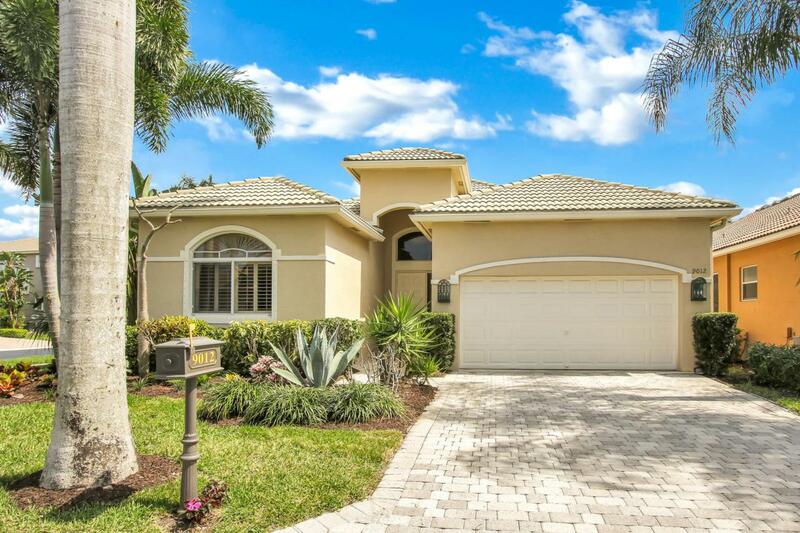 THE GRANDE HAS ITS OWN HEATED COMMUNITY POOL, FAST ACCESS TO THE MAIN GATE , PBI AIRPORT, I95 & TURNPIKE. THE WORLD CLASS & PRIVATE IBIS GOLF & CC HAS TIGHT 24/7 GATES & SECURITY, WITH 1ST AID CERTIFIED/ LIFE SAVING OFFICERS. HOA TAKES CARE OF THE LAWN, PRESSURE CLEANING, HOUSE PAINTING- PERFECT FOR A PEACE OF MIND COUNTRY CLUB LIFESTYLE EXPERIENCE, YEAR ROUND OR WHEN VACATIONINGDOWNSIZE YOUR SQUARE FOOTAGE, UPSCALE YOUR LIFESTYLE: EVEN WITH THE MANDATORY EQUITY CLUB MEMBERSHIP (50% WILL BE RETURNED UPON SALE), THE LOW PRICE OF THIS NEWER CONSTRUCTED HOME & ITS LOW TAXES MAKES THIS PURCHASE A FINANCIALLY SMART LIFESTYLE UPGRADE! LUXURY COUNTRY CLUB LIVING AT A REALISTIC PRICE. THE CLUB AT IBIS OFFERS PRIVACY AND SECURITY ON 2000 ACRES OF MANICURED GREENS WITH 3 CHAMPIONSHIP NICKLAUS GOLF COURSES, TRANQUIL WATER VIEWS, THE MODERN, UPSCALE, YET RELAXING 80,000 SQUARE FOOT CLUB HOUSE & AMENITIES, AN INNOVATIVE FITNESS & SPA COMPLEX, 16 COURT- TENNIS CENTER, A SPARKLING 25 METER HEATED LAP POOL, A FUN CHILDREN'S SPLASH ZONE, DOG PARK, BASKETBALL, PICKLE BALL, PLAYGROUND, FINE CUISINE AND DINING AT 4 RESTAURANTS, PARTIES, CLASSES, CULTURAL EVENTS, CARD GROUPS, EXCURSIONS LECTURES, WORKSHOPS AND SO MUCH MORE! FUN AND EXCITEMENT FOR ALL MEMBERS OF YOUR FAMILY AND YOUR VISITORS ALIKE! 4 MEMBERSHIP LEVELS RANGING FROM $50,000 SOCIAL SPORTS, $55,000 FOR TENNIS, $70,000 FOR SIGNATURE GOLF TO $90,000 FOR PREMIER GOLF. SEE ATTACHMENTS FOR DETAILS.